She has a 350 V8, granny 4 speed, Chevy differentials, and transfer case, 9 inches of lift, Holley 650 carburetor, and 38 inch Mudders all around. More of what I want to do will show as I go. Editor's Comment: Tough looking YJ, Tommy. 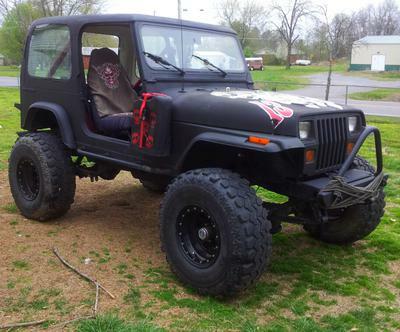 Lots of Chevy drive parts, but still a Jeep. Also like the gerry can mounted on the side. Nice touch! Wow...she's a beast!!! That's serious!! !